“Indeed, Woodward did try to enter the hospital room, but was interdicted by the agent in the hot seat [outside Casey’s door] and gracefully shown to the exit,” Shipp recounts in “In from the Shadows: CIA Secrecy and Operations,” the first published account of the controversy by a member of Casey's security detail. Shipp provides no first-hand details or documentation for his assertion. In the famous encounter, Woodward wrote that he slipped into Casey’s room for a four-minute interview. "You knew, didn't you?" 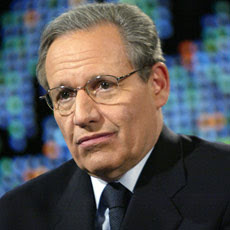 Woodward asked Casey, referring to the Reagan administration’s illegal diversion of funds from selling arms to Iran to the Nicaraguan contras. "His head jerked up hard," Woodward wrote. "He stared, and finally nodded yes." Now an associate editor of The Washington Post, where he has played a main or supporting role in several Pulitzer prizes since 1973, Woodward has successfully weathered repeated challenges to his account of Casey's last remarks. On Monday, responding by e-mail to questions about Shipp’s allegation, Woodward said, "I don't think any security guard was there 24/7 during that period." He referred me to his Web site, where other accounts back up his version of the incident. One, by investigative reporter Ronald Kessler, quotes William Donnelly, a top CIA administrator who supervised the security officers, as saying, "Woodward probably found a way to sneak in." In addition, Kessler reported in his 2003 book "The CIA at War," any assertion that the CIA director “could not speak” at the time Woodward entered his room is mistaken. “When I saw him in the hospital,” Robert Gates, Casey's deputy at the time, told Kessler, “his speech was even more slurred than usual, but if you knew him well, you could make out a few words, enough to get a sense of what he was saying. I briefed him on developments at the agency and the White House." But a number of CIA people, including Casey’s widow Sofia, still cannot bring themselves to believe Woodward’s account, if only because the CIA chief so fiercely advocated sending leakers to jail. That was enough to mute calls for a leak investigation. Next Monday, Simon & Schuster is scheduled to publish Woodward's latest insider book on American presidents: "Obama's Wars." Finally someone has come forward from the CIA and called out Mr. Woodward. It's good to see someone like Mr. Shipp step forward with some cajones and deliver the truth from within the CIA to the public. I look forward to reading "In From the Cold" and his forthcoming publications. WAS BOB WOODWARDS COME BACK TO THESE ALLEGATIONS REALLY ONLY AS FOLLOWS????? Woodward said, "I don't think any security guard was there 24/7 during that period." REALLY??? THE DIRECTOR OF THE CIA??? I DON'T THINK ANY SECURITY WOULD BE THERE 24/7????? WOW....HE'S DUMBER THAN WE THOUGHT. WHAT A LIAR.